Lavender roses are a unique floral creation. The popularity of lavender roses owes a lot to their unusual color, which appeals to gardeners looking for something out of the ordinary. Since the majority of roses are some shade of red, pink, or white, lavender or purple roses carry an air of mystique and intrigue. 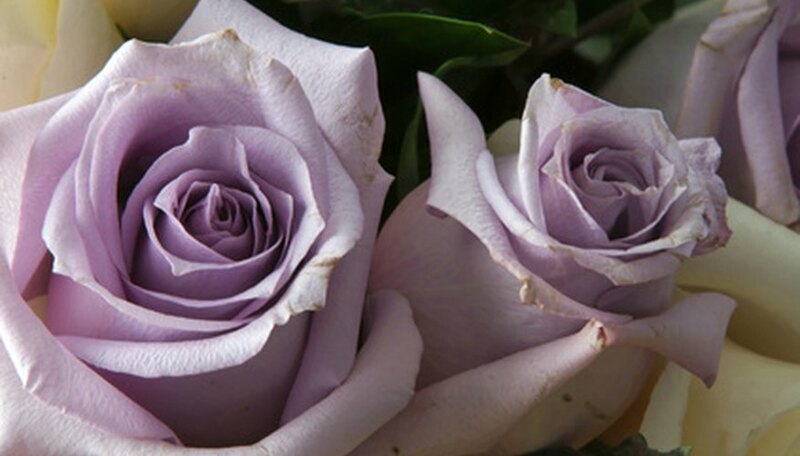 In the language of flowers, a purple rose means "love at first sight." It can also symbolize enchantment, mystery, or royalty. ‘Lavender Delight’ is a soft mauve miniature rose with a soft scent. The blooms are semi-double and open flat and blooms repeatedly throughout the summer. This compact rose works well planted in the garden or in a container and will grow to 18 inches tall. Hardy from Zones 6 to 10, ‘Lavender Delight’ is vigorous and fairly disease resistant. ‘Blue Moon’ is a very fragrant hybrid tea rose. The graceful, long stems generally have one large blossom at the end. This rose flowers repeatedly all summer through fall. ‘Blue Moon’ does best when it is in a warm climate, a sunny location, and against a wall for protection. A vigorous bush, it is hardy in Zones 5 to 9. The shrub rose grows to 6 feet and the climbing rose can reach heights of 12 feet. ‘Blue Nile’ is a lavender-blue hybrid tea rose that produces single, large flowers at the end of its exceptionally long stems. It has a strong fragrance and blooms repeatedly throughout the summer. Hardy from Zones 6 to 9, ‘Blue Nile” prefers warmer climates. This extremely fragrant rose produces beautiful lavender flowers with ruffles petals that are edged in scarlet. Extremely disease resistant, ‘Angel Face’ is a favorite of gardeners since it is easy to grow. Although it is hardy in Zones 5 to 9, it does better in a warmer climate, blooming with brighter colors. If you grow it in a cooler climate, be sure to plant it in the warmest, sunniest location you have. This repeat bloomer has a deep purple plum-colored blossom that turns to a soft lavender as it ages. An intensely fragrant rose, this repeat bloomer puts forth flowers all through the summer. The foliage is a deep green and tends to be bushy. “Melody Parfumee’ is hardy from Zones 5 to 9 and can grow 5 feet tall. Roses and Everything About Them: ROSES: Which Is Which?